The Indian Pygmy goose has a substantial range and is native to India, Sri Lanca, south China and southeast Asia occupying any suitable habitat being large bodies of open water with quantities of emergent vegetation that provides the greater part of the diet. The wild population is significant and it is not considered to be under threat with the possible exception of the sub-species albipennis that has a very restricted range on the east coast of Queensland, Australia. Indian Pygmy goose males do not attain full breeding plumage until their second year and they also have a very distinct eclipse plumage when the male closely resembles the female. In breeding plumage the male is a very striking bird with predominantly white and pale grey plumage with distinctive black markings and iridescent wing coverts and a strikingly bright orange /red iris. Unlike the Green and African Pygmy geese the female Indian Pygmy has no iridescence and is quite a uniform pale grey / brown with darker wing coverts and almost appears some what dove like. Indian Pygmy geese have never been common in captivity but sadly in Europe their numbers have declined in recent years and the captive population can probably be considered vulnerable and this is quite surprising because they are the most hardy of the Pygmy geese but should still be provided with a degree of protection during the winter. Their diet is very straight forward and they will thrive on various small seeds, a good quality Foreign Finch mix being ideal along with quantities of green food that they will relish if placed on the water, lettuce and spinach work very well in this regard. If they can also be tempted to take some of the floating waterfowl diet or even conventional pellets this would almost certainly be ideal but I have found that they are relatively easy to rear on conventional crumbs and pellets and then as they mature and are introduced to some seed thy very quickly become very fickle about taking pellets. It might be sensible to consider never letting young birds have access to seed and presumably they could permanently be maintained on a pellet diet that would almost certainly be more appropriate. Off all the Pygmy geese the Indian would appear to be the least vocal, the females do make a variety of excitable cries but except during the breeding season it is very unusual for the males to call. However when breeding the males do have a very distinctive and pleasant call that they make while displaying and their display is quite something. They pose to the females with their head bent forward and their bill vertical to the water and they then partially raise their wings to present their iridescent green wing coverts to maximum effect. Rather disappointingly the males retain their breeding plumage for a relatively short time but a displaying male Indian Pygmy in pristine condition is quite a stunning site. The demure females do not appear to lay until they are two but can then be expected to do so relatively easily and two or three clutches of relatively small oval dull white eggs can be expected. The clutch can be quite large and anything from eight to twelve eggs can be expected that take approximately 23 days to incubate. A variety of nest boxes should be provided and they are particularly eager to use hollow logs, ensure that there is ample perching space immediately in front of the nest box because the females do get very heavy when laying and appear to be less agile in flight so it is advisable to make entry to the nest box relatively easy. Indian Pygmy ducklings are easier to artificially rear than Africans, after a reasonable period of resting pot hatch they should be introduced to a brooder that provides access to water that thy can swim on. Crumbs and some of the floating micro rearing crumbs should e provided on the water surface. Once these are being consumed from the water surface try tempting them to eat dry crumbs at the waters edge and again a soon as these are being taken move the feed further away from the water and eventually provide in a shallow pan. Once the ducklings are taking dry feed it is easier to keep their swimming water very clean. Young Pygmy geese appear to have surprisingly dense down and every effort should be taken to keep the ducklings as clean as possible so that the proofing is not impaired. The duckings will readily spend most of their time on water only leaving to feed and if this can be achieved they grow rapidly and rearing to fledging is relatively straight forward. From a very young age some finely chopped lettuce or spinach should be provided on the water surface, this is usually taken with relish. If there is difficulty getting the ducklings to initially feed some mini mealworms can be used to tempt them but I would recommend only doing this as a last resort, once they have started taking live food it can be quite challenging to wean them onto dry feed. Adult pair, note the intensity of the males iris that becomes an intense orange as breeding condition is attained. Full breeding plumage is not attained until the second year. Adult trio of Indian pygmy geese with the male just moulting into breeding plumage. 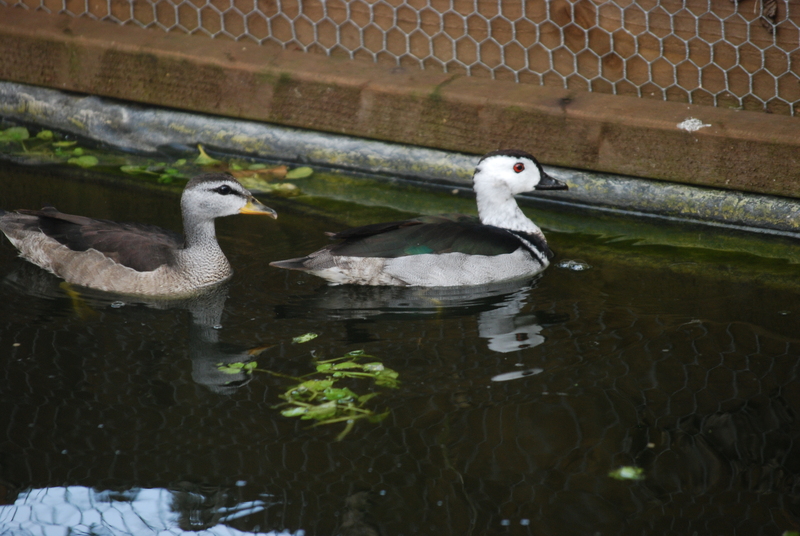 First year male Indian pygmy goose. One year old pair, noye the male does not attain full breeding plumage until the second year. Indian and African pygmy goose eggs, the eggs are very similar in size and the Indian eggs are much whiter and so not have the wax coating that is typical of Africans and more obvious on the first eggs of the clutch.